Released in 2003, Brother Bear arrived during one of Disney’s rougher periods. While Pixar and Dreamworks were seeing strings of success with the likes of Finding Nemo and Shrek, Disney was having trouble reclaiming their former glory. While some of the Disney movies released in this time attempted to branch out from the studio’s norm to try to regain an audience, Brother Bear instead opted for a safer approach. The end result is an honest effort at storytelling, but an ultimately uneventful one. The story follows Kenai (Joaquin Phoenix), a young hunter who has come of age, and is ready to receive his spirit totem from the village elder. The totems are represented as necklaces in the shape of an animal, with Kenai’s older brothers Sitka and Denahi having the Eagle of Guidance and the Wolf of Wisdom, respectively. Kenai’s totem is to be the ‘Bear of Love,’ but he dismisses his totem, believing bears to be thieves. When a bear takes some salmon from a fisherman, Kenai sets out to hunt the bear and prove himself a man in his own way. But the ensuing struggle results in the death of his brother Sitka, leaving Kenai to seek vengeance against the bear. 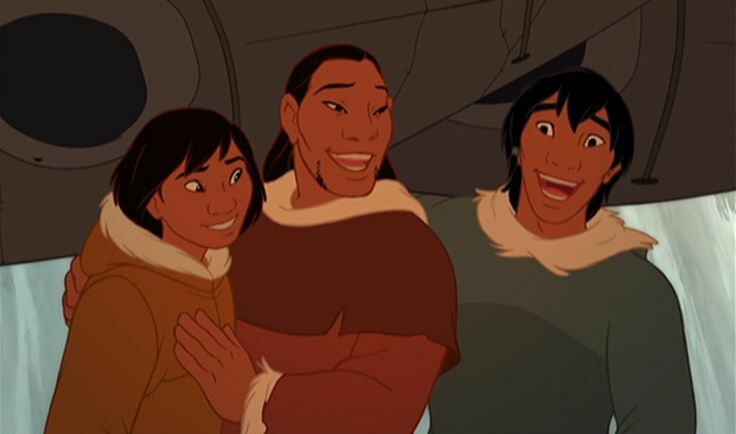 Kenai succeeds in killing the bear, but is subsequently transformed into a bear himself by the ghost of his brother, so that he can see the world from a different point of view and live up to his totem. The plot is a bit straightforward, with Kenai befriending a young bear cub named Koda, who serves both the roles of comic relief for younger audiences and giving the film some sentiment with his relationship with Kenai. There’s also the obligatory comedic duo with two moose brothers named Rutt and Tuke. Most of the characters seem to be filling their roles at a basic level, never really breaking from their archetypes. The story also lacks surprises and moves at an uneven pace. Though Brother Bear does have some small bits of inspiration. The movie has a unique take on its villain scenario, with Denahi taking the role of antagonist as he tries to hunt Kenai, mistaking him for the bear that killed Sitka and believing Kenai suffered a similar fate. Having the two brothers become inadvertent foes is a departure from Disney’s usual preference of hero versus villain, and the moments when Denahi comes face to face with Kenai are the film’s most exciting scenes. Brother Bear also weaves some interesting visual techniques into its narrative. 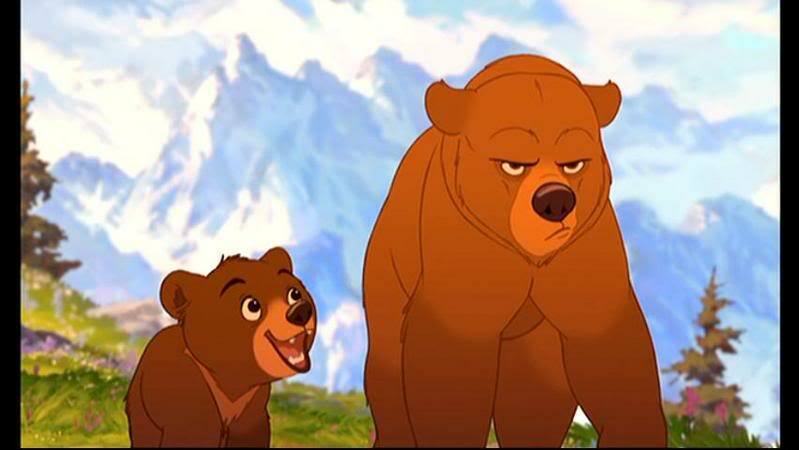 Although the animation in Brother Bear is quite basic by Disney’s standards, it cleverly switches styles during different points in the story. When Kenai is human, the character designs are more realistic and the colors are more Earthy. But once Kenai is turned into a bear, the characters become more cartoony, and the film becomes a lot more bright and colorful. Even the screen presentation shifts alongside Kenai’s transformation. But that’s about where Brother Bear’s inspiration ends. The rest of the movie has a distinct lack of creativity. It has some well-intentioned emotional moments, but they never stack up to Disney’s better works. Similar to Tarzan, a number of background songs are performed by Phil Collins. It’s a decent soundtrack, but not entirely memorable when compared to those of other Disney movies. In the end, Brother Bear provides some simple entertainment that younger audiences might really enjoy, but it lacks the extra effort in storytelling and animation that is often associated with the Disney brand. It’s a well-meaning tale of brotherly love, but it lacks in imagination and substance. It reminds me a bit of Brave as, when Kenai turns into a bear, things go downhill fast. The difference is Brother Bear never hints at having the same potential as Brave does in its early minutes. I often wondered why Brave took the direction it did with the story, seeing as it was pretty similar to Brother Bear in a lot of respects. Neither one ended up being anything special, but at least Brother Bear isn’t overrated. Can’t say the same about Brave. Brave has the Pixar stamp, which is far more valuable than the Disney seal was back when Brother Bear came out, so that explains how it is overrated. Still, I must say I would rather watch Brave than Brother Bear.